In the early 18th century chocolate became a popular beverage among the nobility and at the court of the Stadholder. Therefore, many silver chocolate pots originated in The Hague (Pijzel 2005, pp. 303-304). The Leeuwarden silversmith Andele Andeles manufactured one in 1754 (Ter Molen 2014, Vol. III, p. 800) and in Amsterdam Jan van ’t Hofken made this early example in 1722. Jan van ‘t Hofken (Utrecht 1669- Amsterdam 1750) became a member of the Amsterdam silversmiths’ guild in 1705. 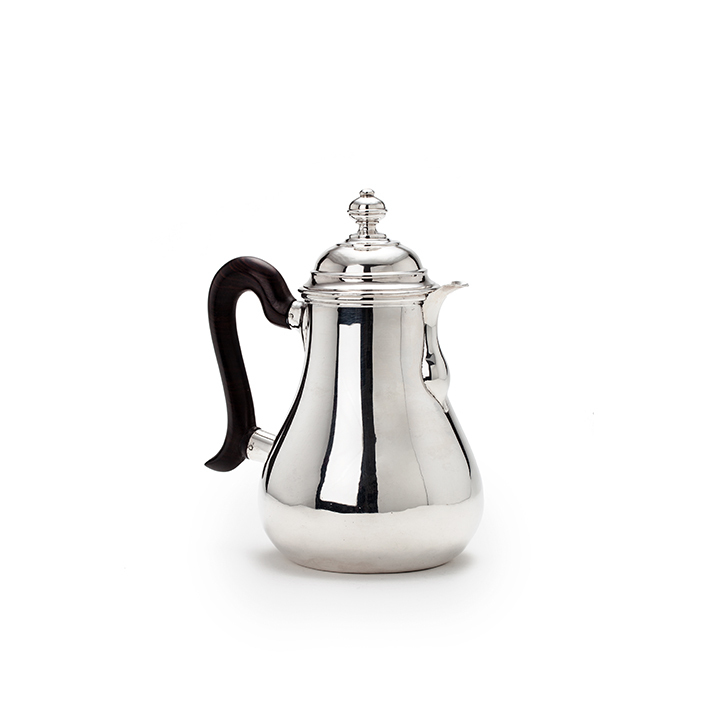 He was a service worker, who made his silver objects in the then fashionable Louis XIV style. Cruet sets, casters, teakettles, salvers and also this chocolate pot are known to have been made by him. A cruet set of his hand, made in 1723, used to be in the Royal collection of the late Juliana, Queen of the Netherlands. Voet Jr., Amsterdamse Goud en Zilversmeden en hunne merken, Den Haag, 1912, p.33 nr. 171 en p.120. K.A. Citroen, Amsterdamse zilversmeden en hun merken, Amsterdam, 1975, nr. 591(biographical information).